(Bloomberg) -- Even migration is bigger in Texas. Dallas leads all U.S. cities as the largest net gainer with 246 people arriving daily, according to a Bloomberg analysis of 2017 Census data on migration to the 100 largest U.S. metropolitan areas. In 2014, the crown belonged to Houston with 269 migrants per day. The migration trend has two channels -- international and domestic. The international portion is the difference between those moving from outside the U.S. and those leaving the country. The second part of the equation, net domestic migration counts those who move in from another part of the country and subtracts those who leave for other U.S. areas. Relocations can lead to large skill and investment transfers. People who choose to relocate to other parts of the country are taking their talents with them. States and local governments make a large investment in educating people and many people further this by investing in a college education, so when one moves, a large investment transfer is occurring. Boise, ID and Charleston, SC reported more than 10 times as many domestic net movers as international arrivals in their metro areas. In 2017, Boise gained 41 people per day and Charleston 28. Data on migration flows are essential for understanding localized growth for everything from employment, real estate trends, retail development to government infrastructure and environmental shocks. Miami, San Jose, Orlando and New York gained the largest share of population from abroad. Boston and Washington tied for the fifth spot. Aside from Orlando, all of these cities lost residents to other parts of the country. Among the 100 most populous metro areas, 28 shrank in total net migration, all due to negative domestic migration. Of the 71 areas posting a net gain, 18 lost residents to other parts of the country and could attribute their gains solely to international migration. New Orleans was the only area where the influx and exodus was a wash. Seven metro areas have been successful in turning the tide on migration flows in recent years. 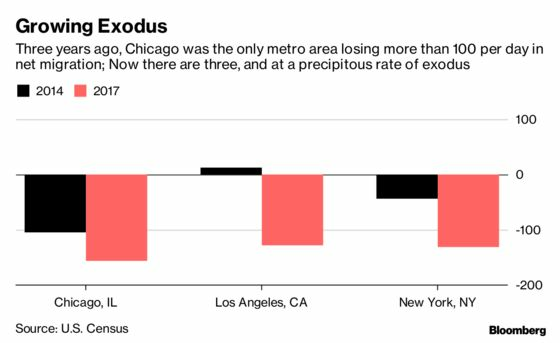 In 2014, Albuquerque, NM; Dayton, OH; Philadelphia, Provo, UT; Salt Lake City, Scranton, PA; and Springfield, MA were all seeing a daily loss due to migration. But these all reported net positives in 2017. "New Mexico’s strong business climate for manufacturers makes for a very compelling value proposition. With a competitive total cost of operations, we can compete with foreign-made product right," said T. C. Huang, Chairman & CEO of I-Sheng Electric Wire & Cable and majority shareholder of Admiral Cable, which recently announced plans to build a new manufacturing plant in New Mexico. These sentiments were echoed in emailed comments from Mark Moores, a New Mexico state senator in Albuquerque -- "Now that we have a more competitive business climate to go with our amazing natural climate, people are rediscovering us." 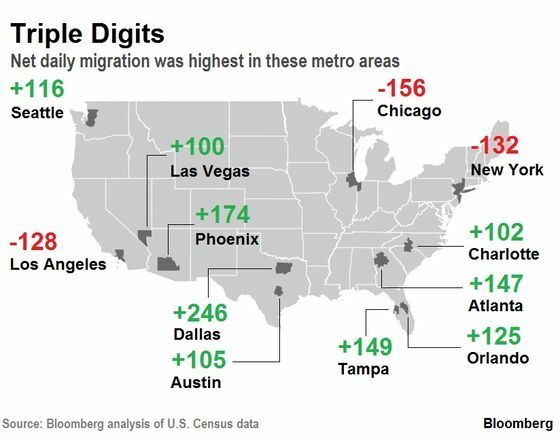 Methodology: Bloomberg ranked the 100 largest U.S. metropolitan areas based on their net migration data, between July 1, 2016 to July 1, 2017, as a percentage of total base population as of July 2016. Domestic migration refers to people moving within the country (e.g. someone moving from New York City to San Francisco). International migration, including natives previously living outside of the country, refers to people moving to and from the United States.